“Believers shouldn’t curse anyone or be quarrelsome, but they should be gentle and show courtesy to everyone.” (Titus 3:2 GW)Gentleness is a witness to unbelievers. They’re watching you all the time to see if you are any different when you’re under stress. When you respond to pressure with gentleness, it is an incredible testimony to the world. The Bible says in Titus 3:2, “Believers shouldn’t curse anyone or be quarrelsome, but they should be gentle and show courtesy to everyone” (GW). If you claim to be a follower of Jesus, you are not allowed to speak evil of anyone. You are not allowed to be quarrelsome. Instead you must be gentle with everybody, and you must show courtesy to everybody. Does that mean even people of a different political party? Yes. God gave me the gift of evangelism, which means I spend most of my time when I’m not at Saddleback Church speaking to people I totally disagree with. But I believe that you cannot win your enemies to Christ; you can only win your friends. People aren’t going to trust Jesus until they trust you first. People usually don’t ask me if the Bible is credible. They want to see that I am credible. Do I live with integrity? Am I gentle? Am I loving? Am I compassionate? If people like what they see, they will listen to what you say. Here’s the thing: If you actually obey Titus 3:2, you’re going to be criticized by other Christians. They’re going to say you’re compromising. I know this from experience. When I say I have friends who are Muslims or atheists or gay or Democrats or Republicans, they say, “How could you do that?” And they accuse me of compromising. Treating other people with respect does not mean you have to compromise what you believe. Being nice to liberal people does not make you a liberal. Being nice to a conservative person does not make you conservative. Nobody gets it right all the time. I have friends who are Republicans. I have friends who are Democrats. I’m for my friends. Why? Because there’s something more important than politics: Do they know Jesus? “Always be prepared to give an answer to everyone who asks you to give the reason for the hope that you have. But do this with gentleness and respect” (1 Peter 3:15b NIV). How are you intentionally making friends from all walks of life so that you can talk to them about Jesus? Why do you think gentleness stands out so much in today’s world? What do you need to do to be better prepared to “give an answer to everyone who asks you to give a reason for the hope that you have”? Have you noticed that human beings have a tendency to mimic the emotions of people across from us? The reason we do this is because of mirror neurons in your brain. They allow you to sympathize and also to mirror what other people feel. For instance, if somebody gets angry with you, you get angry back. If somebody is really depressed and you hang around that person long enough, you get depressed. In the same way, when people raise their voice against you, you usually raise your voice back. Then they raise their voice higher. Then you raise your voice higher. Then pretty soon it’s escalated, and your emotions are out of control. The Bible says, “A gentle answer turns away wrath, but a harsh word stirs up anger”(Proverbs 15:1 NIV). Let me give you a little tip that will save you a lot of heartache and conflict in your life: When other people raise their voice, lower yours — in your marriage, in your parenting, in your friendships, and at work. That’s called strength under control. Gentleness defuses conflict. It deescalates anger. Here’s a good verse you’re going to need someday — maybe even this week. Ecclesiastes 10:4 says, “If your boss is angry at you, don’t quit! A quiet spirit can overcome even great mistakes” (NLT, second edition). When your boss rips into you or your spouse raises his voice in anger, you need to realize it may not have anything to do with you. Instead of getting defensive, practice gentleness. Let your gentle answer disarm the other person and diffuse the situation. What is your normal reaction to raised voices, such as when your kids are misbehaving or there is a disagreement with your spouse or partner? Why do you think responding in gentleness rather than anger is so disarming? Why does it get people’s attention? Look for ways to practice gentleness this week. How do people react when you respond to them with gentleness? You may even want to record your efforts and their effect and share it with your small group. Grace is God’s unmerited favor. It’s kindness from Him that we don’t deserve. Grace empowers us and strengthens us. No matter what has happened in your past, you can receive God’s grace and start fresh today. You can hold your head up high because His grace is enough. You may not be perfect, but you are forgiven and empowered to live in victory. Today, receive His grace. Don’t hold on to past mistakes. Jesus has already paid for them. All you have to do is receive His grace and thank Him. Take it one step further and extend that grace to others. Don’t try to punish people for their past mistakes; instead, give them favor to start over. As you allow God’s grace to flow through you, you’ll see yourself rise higher, and you will enjoy God’s blessing all the days of your life! Knowing God is for you will change your whole perspective on life. You’ll stop thinking of God as someone looking down from Heaven, ready to yell “Gotcha!” any time you mess up. God is for your success in life. He created you for a purpose, and he wants you to succeed. It is God, your Creator, who will measure your success in life, and no one else. Jesus came to save us, not to scare us. How would your life change if you consistently believed God is for you? Ask God to help you in your unbelief. What misconceptions about God make people afraid of him? How does God use discipline for our good? You may understand that God wants you to succeed. How does he help you succeed? (Matthew 11:28, NIV)SHARE WITH YOUR FRIENDSRest for Your Soul God wants to give you rest. He wants to refresh and restore your soul. It’s so easy sometimes to get caught up in the “busyness” of life. Before long, your mind, will and emotions are so “spun up” that you can barely think straight! But even in the hustle of life, you can find rest, ease and relaxation. That’s what God has for you. He wants you to enjoy your life. He wants you to come to Him so He can take care of everything that concerns you. Today, choose to release your cares to the Lord. Let Him fill you with His peace and joy. Receive the rest that He promises and enjoy the fulfillment and blessing He has for you! Faith is visualizing the future. It’s believing it before you see it. Hebrews 11:1 says, “Faith is the confidence that what we hope for will actually happen; it gives us assurance about things we cannot see” (NLT, second edition). Which one was right? They both were. Jesus said, “Unless you are born again, you cannot see the Kingdom of God” (John 3:3). Before there is spiritual transformation in your life, you’re too narrow-minded to see the possibility of what God wants to do in your life. What do you believe God wants you to accomplish in your life? How should faith affect your goal setting? Why do you think God wants us to believe in faith instead of just showing us before we believe? It took me a while, but I finally figured out that this marriage thing is about communication. I discovered that on the days that I had deep, soul-communication with my wife Kay — not “Hi. How are you? I love you. See you later” — that’s when our relationship would grow. And on those days when we have little or no communication, our relationship decays. A relationship is never standing still. It’s either growing or decaying. The same is true with God. On the days when you have deep, significant talks with God, your relationship grows. On the days when you have little or no conversation with God, your relationship decays. It’s that simple. When you really love somebody, you don’t just want to spend time with him. You want to talk with him. Remember when you first fell in love as a teenager and your parents got upset because you were always on the phone? You talked and talked and talked because you were getting to know that person. Communication is how you get to know others. What do you talk about if you want to express love to God? Anything that you’d talk to your best friend about: your hopes, your fears, your dreams, your anxieties, the things you’re embarrassed about, the things you’re proud of, the things you’re ashamed of, your goals, your ambitions, your hurts, your cares — every part of your life. If you don’t feel close to God because your Christian life has become routine, dull, joyless, and lifeless, there’s a simple remedy: Start talking to God again. Prayer is not some duty that you have to do. It’s a privilege that you get to do. You get to talk to the Creator of the universe! He’s waiting on you to have a conversation with him so that your relationship can grow. (Psalm 85:8, NIV) The Promises of PeaceNo matter what is going on in your life right now, the Lord promises that you can have peace. It doesn’t matter what’s happening in the economy, in your relationships or at the office; nothing in this world can take His peace from you. But notice the first part of this verse—we have to do our part. We have to listen to what He tells us to do. You may be thinking to yourself, “God doesn’t speak to me.” But once you receive Jesus as your Lord and Savior, you become His. The Bible says that you are His sheep, and you can hear His voice, and the voice of a stranger you will not follow. The Lord speaks in many ways. First of all, He speaks through the Word of God. But sometimes, He speaks through the encouragement of a friend, or through a song, or in the beauty of nature. Sometimes it’s a simple “knowing” deep down on the inside of you in your spirit. If you aren’t sure how God speaks to you, ask Him to teach you. Open your heart and be willing to hear His voice. As you take time to be still and listen to Him, He will speak. He will reveal Himself to you and give you peace all the days of your life. Hope Comes from Him. God is constantly planting seeds of hope and victory in your life. He’s constantly speaking to your heart and encouraging faith. Often times, when we’re anxious and worried, it’s difficult to hear His voice of hope and confidence. But when we stop and quiet ourselves, when we find rest in Him, we can more easily recognize His voice of hope. The Bible says that faith gives substance to the things we hope for. In other words, your hope gives your faith something to work toward. Hope is the foundation for your faith. If the cares of this world have left you frustrated and empty, make the decision right now to open your heart and allow the Lord to deposit His hope on the inside of you. It doesn’t matter what you are facing today or what’s happened in your past, there is hope for the future. Believe it and receive it today! Hope comes from Him! When our dream is delayed, it causes us to forget many things. We tend to forget our dream. We forget what God has done in our lives and his goodness to us in the past. We tend to forget that God is with us. We forget God’s power. It’s unbelievable how short their memory was! In Egypt, God sent 10 plagues on the Egyptians just to rescue his people, and the children of Israel forget it just a few days later when they’re at the Red Sea saying, “We’re all going to die!” They forgot what God had done. Then, God does a miracle and opens the Red Sea. They walk through to the other side and immediately forget that miracle and cry, “We’re going to die of thirst!” God miraculously provides water. The Israelites forget that and complain, “We’re going to die because we have no food!” They were always forgetting. But we shouldn’t be too quick to judge them, because we do the exact same thing. When a delay occurs in our lives, we start acting like God’s never done anything for us. Has God done things for you in the past? Sure he has. And you can count on him to do it again tomorrow and the next day and the day after that. Instead of forgetting, you need to remember God’s promises. There are more than 7,000 of them in the Bible. Whenever you have a problem, find a promise, like 2 Timothy 2:13: “Even when we are too weak to have any faith left, he remains faithful to us and will help us … and he will always carry out his promises to us” (TLB). The promises are always greater than the problems you’re facing! God may not have fulfilled the promise in your life because he’s waiting on you. He’s waiting on you to learn to not fear, not fret, not faint, not forget. He wants you to learn that before he delivers you. God can do things immediately, but he’s working on a larger agenda. The delays that come in your life do not destroy God’s purpose. They fulfill God’s purpose in your life. “I will bless the Lord and not forget the glorious things he does for me” (Psalm 103:2). Jesus replied to the criminal hanging on the cross, “I assure you, today you will be with me in paradise” (Luke 23:43 NLT). Your assurance of salvation is the same: God’s promise that you will be in Heaven with him one day if you believe in faith. Sometimes, the day-to-day pressures of life can cause unnecessary stress. In fact, many people lose sleep worrying about things or people in their lives. But God doesn’t want us to live stressed out and overwhelmed. He wants us to live a life of rest and peace. When Jesus walked on this earth, He took time for Himself. He got away from the crowds. He spent time with the Father. That’s how He found rest. He was gentle and humble in heart. Do you ever notice that when you are stressed out or worrying about something, you’re less tolerant of others? You’re more likely to say something you don’t really mean. Today, God wants you to cast your cares on Him and live with a gentle and humble attitude. Release your burdens to Him. Follow the example of Jesus, and you will find rest for your soul. But God instructs us to practice forgiveness. And when we choose to follow the path of forgiveness, we will experience the peace and joy that come through obeying God's Word. Can you believe that? We're to pray something like, "Oh, Lord, I pray that You'd just make them so happy!" Why You Must Follow ForgivenessThat's why we need to pray for them and say, "God forgive them." In fact, what does God say will happen to us when we obey His Word? Luke 6:35 states "…and then your recompense (your reward) will be great (rich, strong, intense, and abundant), and you will be sons of the Most High…." God tells us that we'll receive a reward. We will get double for our trouble if we will do things His way. The Bible says that love covers a multitude of sins. Do you know what that means? It means that love will even have you making excuses for your enemies. Someone might come up to us and say, "Well, I heard what so-and-so did to you." When we really decide to forgive someone and pray the prayer that blesses our enemies, making the decision that we will not talk bad about them, but instead, cover their fault and their mess, we still might not feel any different. Now, I believe choosing forgiveness is one of the most difficult things God asks us to do, especially if we believe that whoever hurt us is in the wrong and doesn't deserve to be forgiven. (Isaiah 45:2, NKJV) SHARE WITH YOUR FRIENDS He Prepares Your PathDo you ever feel like that every time you try to move forward in something, you hit a roadblock? Maybe something happens that throws you off course? Be encouraged today because right now, God is going before you. He’s preparing a way. It may not be the way you thought, but you can be sure that God’s ways are higher than our own. Trust that He is making your crooked places straight and your rough places smooth. You may be going through a difficult time right now, but it’s not the end. It’s only the beginning. God has equipped you for this journey. Keep speaking words of faith and listen for His still, small voice. Trust that He is leading and guiding you. Keep an attitude of praise and thanksgiving and move forward in the good things He has prepared for you! (Luke 7:47, AMP) SHARE WITH YOUR FRIENDS The Door to Love Did you know that forgiveness opens the door for love to operate in your life? Today’s verse is talking about the story of the woman with the alabaster box of costly perfume. She was a notorious sinner in her day, but when she encountered Jesus, her life changed. She fell at His feet in worship and began washing His feet with her tears and drying them with her hair. When she received Christ’s forgiveness, love was the automatic response. She was forgiven much, and her love was extravagant. Do you want more love in your life? Do you want to feel more of God’s love and have stronger relationships with the people around you? Open your heart to forgiveness. Receive Christ’s forgiveness and extend it to others. When you are forgiven much, you will love much, and His love will empower you to rise higher in every area of life! We all have people in our lives that are difficult at times. Maybe it’s someone you work with, a family member, or even your spouse. Relationships can be complicated, but always remember: love never fails. 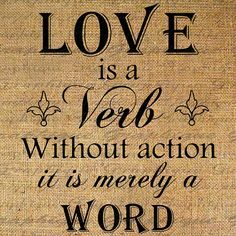 The Word of God clearly defines love in 1 Corinthians 13. It says that love is patient and kind. It doesn’t seek its own way. It keeps no record of wrongs. And most importantly, love never fails. Notice that this chapter on love doesn’t talk at all about how you feel. God’s love isn’t about feelings. It’s a choice. You can choose to be patient, even when you don’t feel like being patient. You can choose to be kind, even when you don’t feel like being kind. No matter what situation you find yourself in, you can choose love. You are never more like God than when you are walking in love. When you are walking in love, you will never fail because love never fails. Open your heart and receive God’s love today! Take a minute to think about it. It’s an important question because your answer will determine how much love you are able to give to others. You see, if you don’t love yourself in a healthy, balanced way, then you won’t be able to spread the love of God to those around you because you can’t give away something you don’t have to begin with. One reason for this is we compare ourselves to other people and wonder why we can’t look or act like they do. Or we believe that God is mad at us for some reason…and then fall into the trap of thinking we need to try harder to measure up. But God’s Word says that those who are in Christ have been made righteous. (Romans 10:9, NIV)SHARE WITH YOUR FRIENDSConfess and BelieveScripture tells us that salvation comes when a person confesses that Jesus is Lord and believes in their heart that He was raised from the dead. In the same way, God’s Word comes alive in our hearts when we confess and believe it. The question is: What are you confessing today? What are you saying about your situation? Are you confessing the Word and believing that God is at work behind the scenes? Or, do you talk about your problems and always believe the worst? Whatever you confess and put your faith in will come to pass in your life. If you’ve been saying the wrong things, it’s time to simply stop and turn your thoughts and words around. You can choose to speak the Word of God any time. Don’t just let your mind and mouth wander. Be intentional. Write down a few Scripture verses and take them with you. Be determined to speak the Word. Confess and believe and walk in victory in every area of your life. The God Kind of FaithFaith is all around us. People have faith in so many different things: faith that a friend will be true, faith that your job is taking you on a certain career path, faith that the chair you are sitting on is going to hold you up! Faith is simply believing in something. But there are different kinds, or levels, of faith. We’ve all been given a measure of faith. The question is, what are you doing with it? The God kind of faith will cause you to believe for things when you don’t even know how they’ll happen. It will take you further than you ever dreamed. It probably won’t make sense in your mind, but you have to allow your spirit to rise higher than your thinking. Don’t ever talk yourself out of believing. Don’t focus on all the reasons why not; instead, allow supernatural faith to rise up within you. Meditate on His Word that says you can do all things through Christ, and you are strong in the Lord and the power of His might. As you rise up in faith, He’ll take you places you’ve never dreamed, and you will live the abundant life He has for you! If you’ve ever had a conversation with someone who was constantly checking his or her phone, then you know how frustrating it can be to have half of a person’s attention. Because, honestly, having half of someone’s attention feels like having none of it. It’s offensive, distracting, and unhelpful when a person is “there but not there.” In the end, it costs everyone unnecessary extra time and attention to move forward. • Consumed by your job. The posture of our lives will tell God whether we really want to hear what He has to say. True disciples position themselves to hear from God. They structure their lives so that when God speaks, they’re ready to listen and respond. Disciples of Jesus know it’s not enough to simply “want” His truth. They go after it. They sacrifice for it. That’s because receiving truth isn’t a passive experience. To learn from Jesus is to actively bend your life around what matters most. In short, we don’t grow as disciples by listening to a sermon every week or even attending a Bible study. Rather, disciples learn and grow by making small choices each day—sometimes each hour—to actively trust Jesus and listen for His voice. After six days Jesus took Peter, James, and his brother John and led them up on a high mountain by themselves. He was transformed in front of them, and His face shone like the sun. Even His clothes became as white as the light (Matthew 17:1–2). Once again, the disciples put real effort into following Jesus. They sacrificed their time and energy in order to be in the right place to learn from Him—and the reward was incredible. It’s not easy to follow Jesus. You’ll sometimes need to scale a mountain just to hear from Him. But the effort will be more than worth it. Unfortunately, some disciples stop at base camp at the bottom of that mountain and find great comfort in never exercising their faith, never growing, and never hearing from God. Others begin the ascent, but the demands of life (or their own bad habits) drag them down well before the summit. But the ones who complete the journey up the mountain will hear from God. And His voice will give them peace, comfort, and joy.